Thank you for always being so nice and helpful and making the whole experience easy and stress free. Very friendly booking staff. There were no kitchen knives only steak knives upon arrival. We called and the next day a new set of knives were waiting for us. Great Service. Everyone we contacted through either telephone or email was always very cordial and attentive to our needs. Kelli was most helpful in accommodating our needs for our stay. Always available for any questions I had. We came here for Thanksgiving. We had a wonderful time with all the grandchildren and great grandchildren on the Polar Express. This cabin had great views and was beautiful inside and out. We enjoyed our stay. We had a lovely time visiting. We rally enjoyed our Thanksgiving Here. Wonderful kid free friend vacation. Loved the hot and the beautiful porch. We will be back and we may even bring the kids. This is our 2nd Thanksgiving staying at your most beautiful cabin. Thank you for hosting. We hope that we are able to return next Thanksgiving and become regulars. Can't wait to come back. Everyone at this company was so friendly and easy to deal with! We are already planning a trip with the other side of the family and can hopefully stay in one of your properties. I would highly recommend this company and house to anyone. We stayed here for Thanksgiving weekend with family and friends and had an amazing time. The cabin is secluded and quiet, family/child friendly, modern and updated (while still being rustic), and had many great amenities. We stayed up way too late each night to play darts, pinball, and soak in the hot tub. 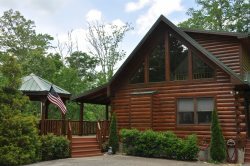 We would all highly recommend this cabin for your getaway or family vacation!